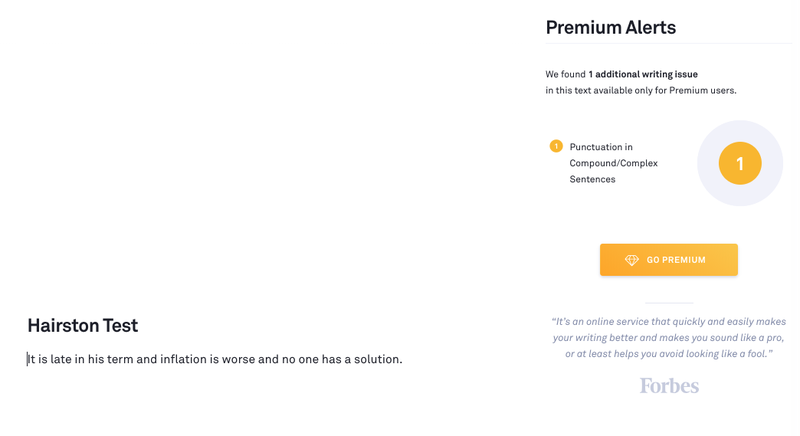 I’ve been meaning to test online “grammar checker” Grammarly for some time. As I’ve said before, everyone wants data, but no one wants to pay for research. 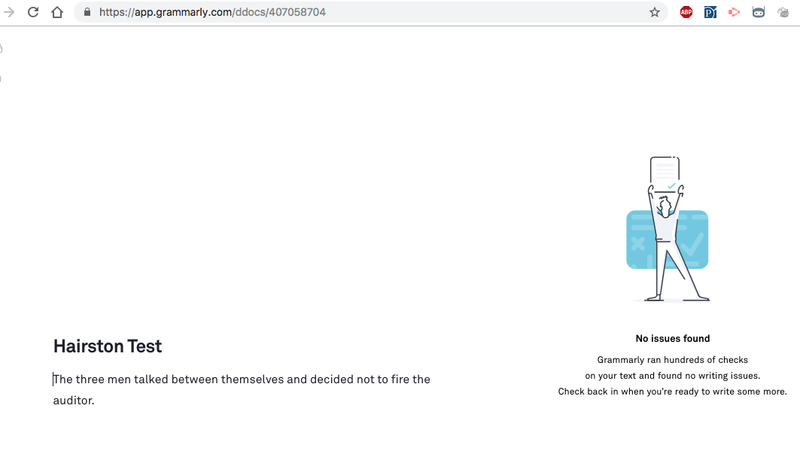 But I so often refer to Maxine Hairston’s 1981 College English article on error that I thought it would be fun to see how sentences from the QUESTIONNAIRE ON CONVENTIONS OF GRAMMAR from that article rate, according to Grammarly. 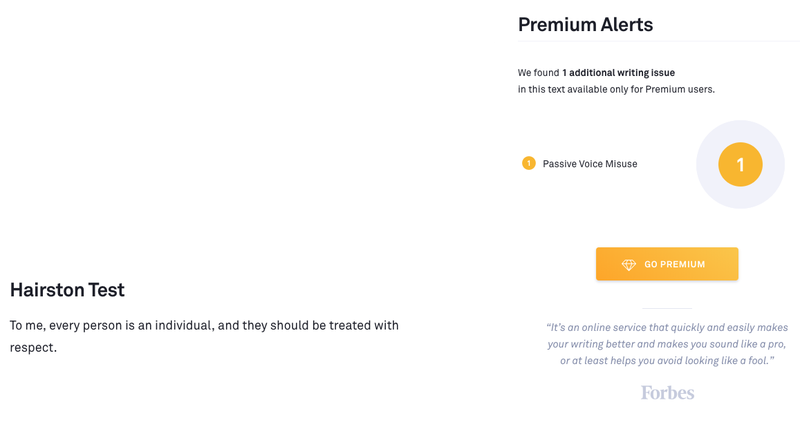 I don’t have time for comprehensive analysis (and I didn’t specialize in anything grammar-y like linguistics, so my analysis wouldn’t be technical anyway) but I’m going to post screenshots of all 65 sentences from Hairston’s article, as assessed by Grammarly, in case others might want to analyze them. Even without systematic analysis, it’s an interesting set of data. 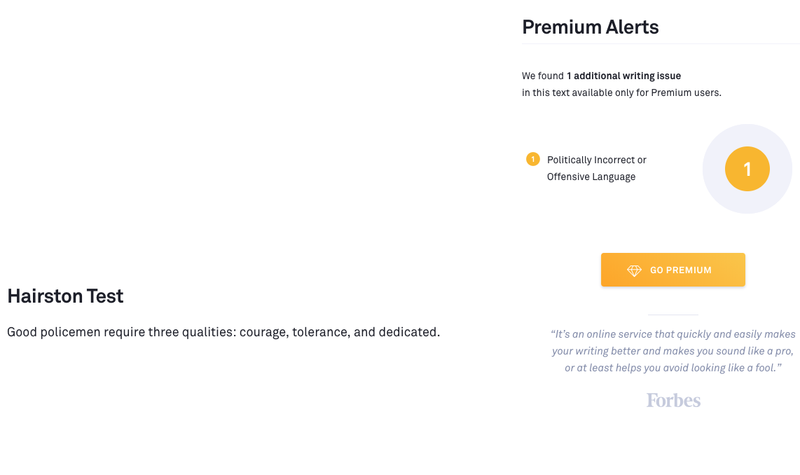 “Good policemen require three qualities: courage, tolerance, and dedicated.” A fairly egregious error in parallel construction which Grammarly misses entirely, instead warning us that something we’ve said in this sentence, extolling the virtues of good policemen, is “politically incorrect.” Presumably what they would advise us to do, if we paid for their Premium Alert service, is change “policeman” to “police officer.” That’s not bad advice, but it would still leave you looking like a politically correct writer who hasn’t mastered parallelism. I’m fuzzy on the specific error here; possibly “whomever” is preferred to “whoever”? Grammarly, however, seems to have keyed in on the passive voice, flagging a supposed “misuse,” but coyly hiding the details behind a paywall. 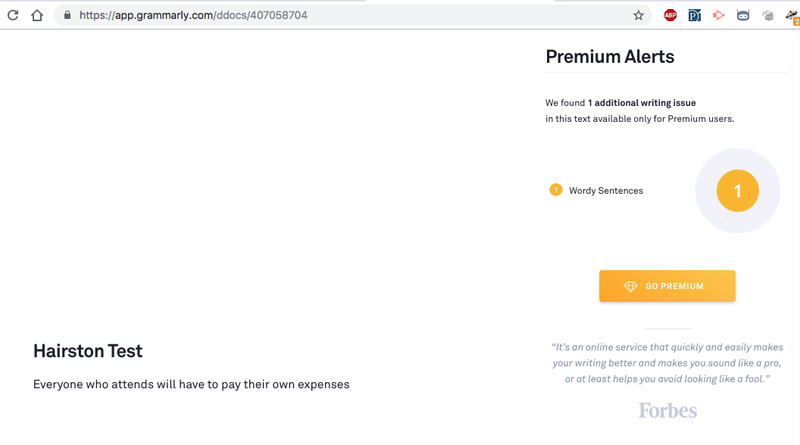 As we’ll see below, Grammarly’s “premium” paid service is required if one wants more detail about everything from comma splices to cryptic “word choice” problems. 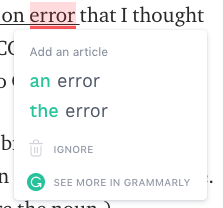 Notice that Grammarly is again recommending substituting an article for some other kind of word. 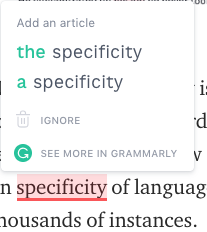 It would be interesting to know, in a world where research is funded, how often Grammarly does this, and what the net effect is on specificity of language when that recommendation aggregates over thousands of instances. 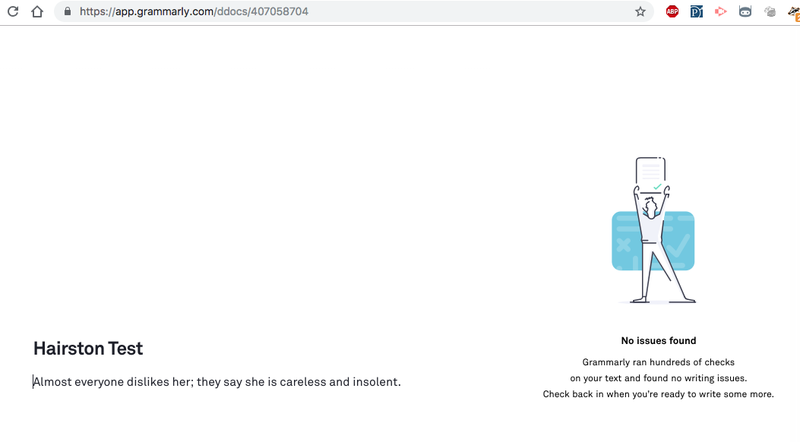 Hairston’s survey respondents apparently felt much the same; 23 of them said the sentence didn’t bother them, while 31 said it bothered them a little, and 20 reported that it bothered them a lot. Compare that to the fused sentence from Sentence Three, which bothered 61 people a lot, 13 a little, and only left five people unbothered. 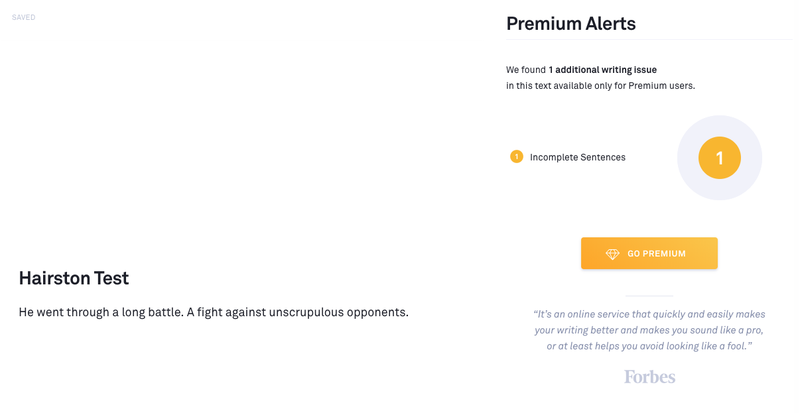 Situations like this make me realize that when we bring up “word choice,” students are likely to assume we’re talking about synonyms and shades of meaning (especially college students, who are learning lots of new discipline-specific vocabulary and also discovering additional nuances in words). Yet very often, “word choice” problems are more idiomatic, especially in regard to the prepositions that certain words are expected to take. 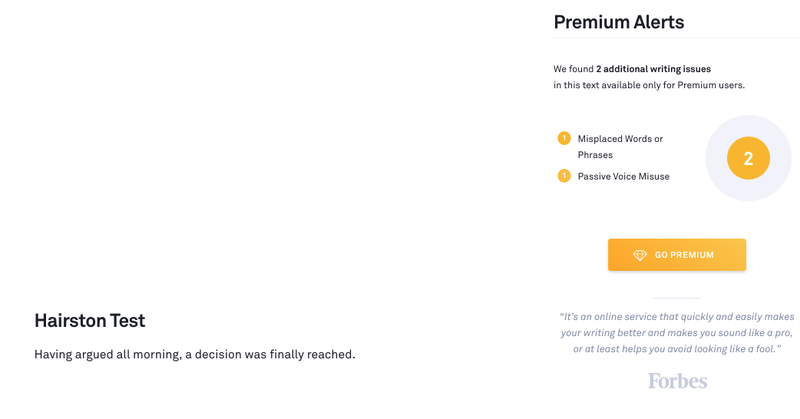 Maybe Grammarly covers all of that behind their paywall. 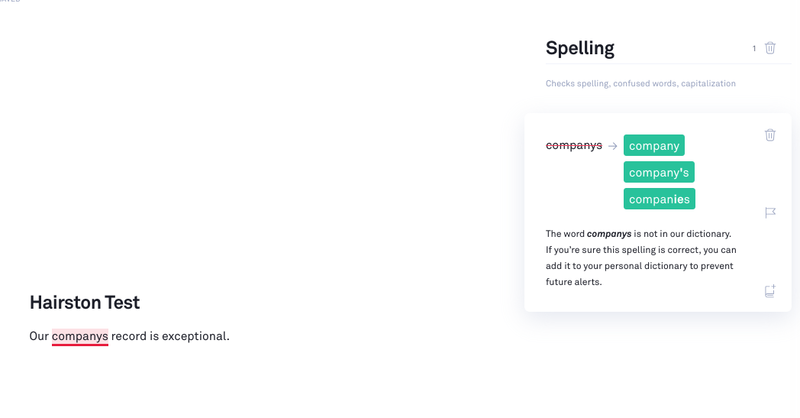 Next, a simple matter of capitalization, which Grammarly handles ably, and for free! 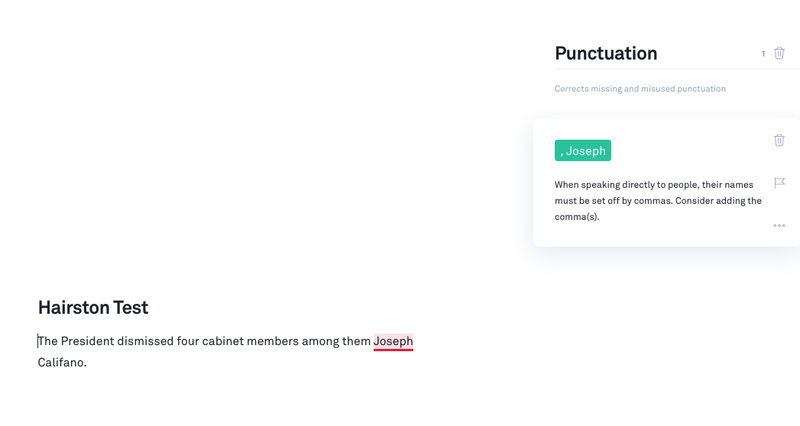 Followed by an embarrassing whiff in Sentence 20, where Grammarly misses a clause calling for a comma and instead recommends a comma to indicate . 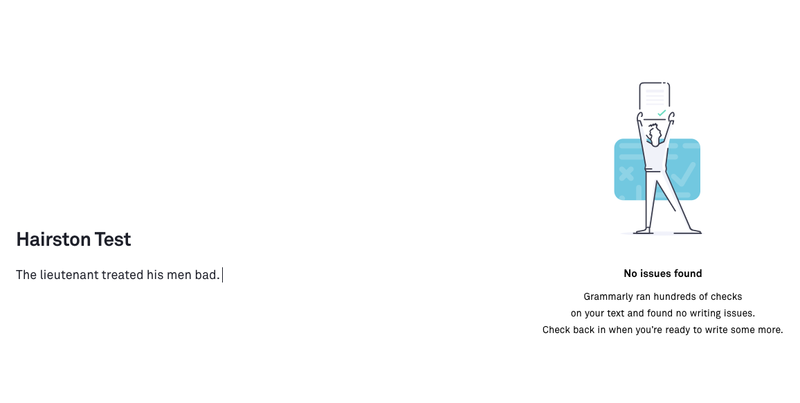 . . direct address??? Another blooper. Shouldn’t detecting an interrogative be a fairly simple task for a computer? Humans have little trouble with it. 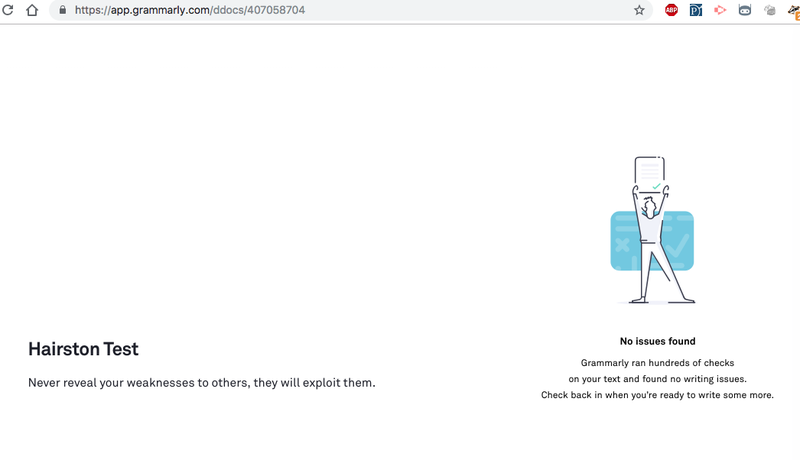 While here, Grammarly is simply recognizing that most people now use “data” as a singular noun, and no one outside the sciences cares much. 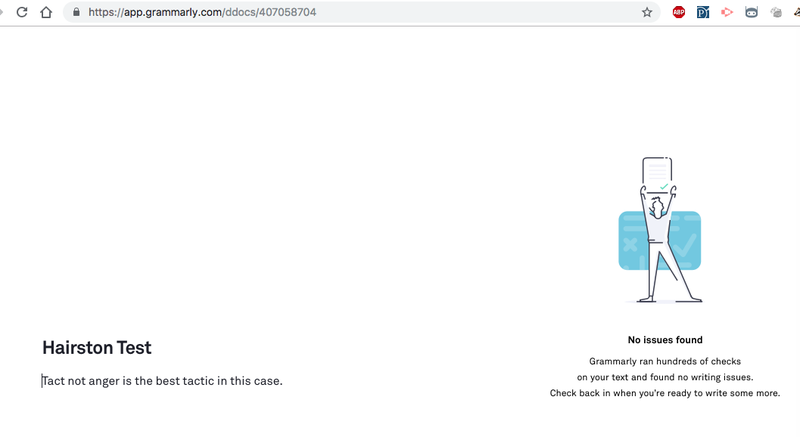 I don’t think Hairston included simple use of the passive as an “error,” so I’m not sure what the error here is supposed to be. 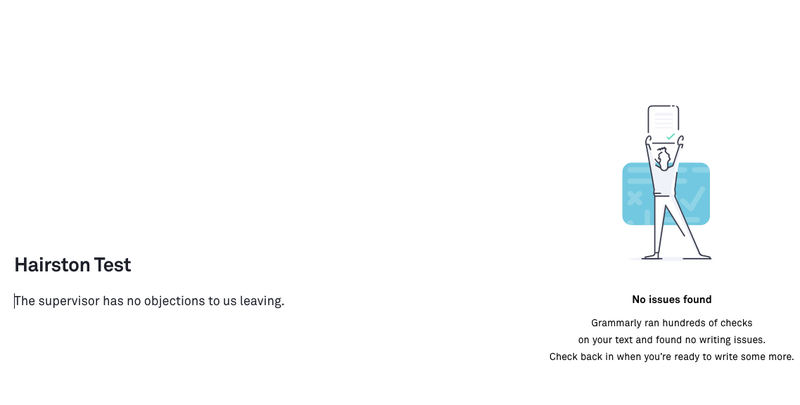 Grammarly thinks it knows, but I left my wallet in my other pants so I guess I’ll never know for sure. 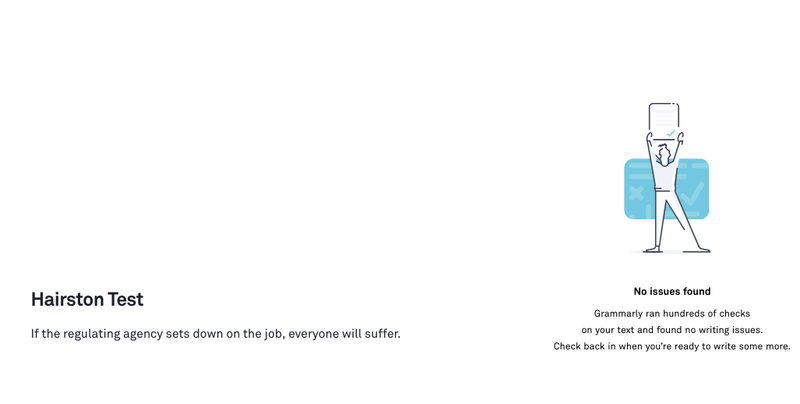 Sentence 45 is reminiscent of the “situation” with the noncomplying patient, above. 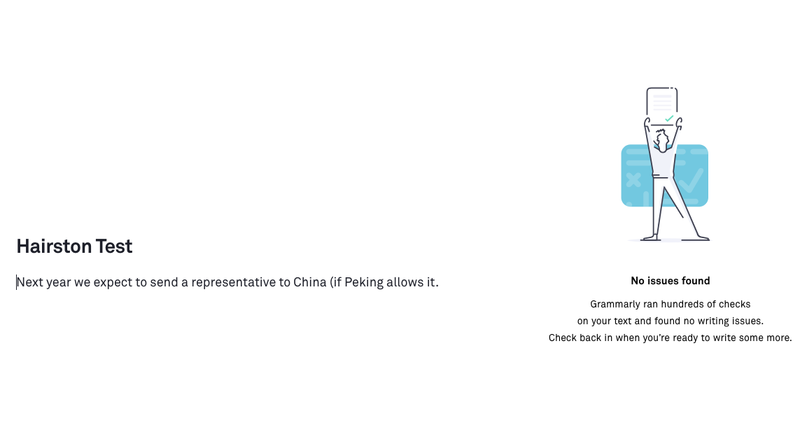 Here though, Grammarly thinks there’s a problem with word choice. The only change that suggests itself to me is to make “refused” to “refuses,” to keep the whole thing in present tense. 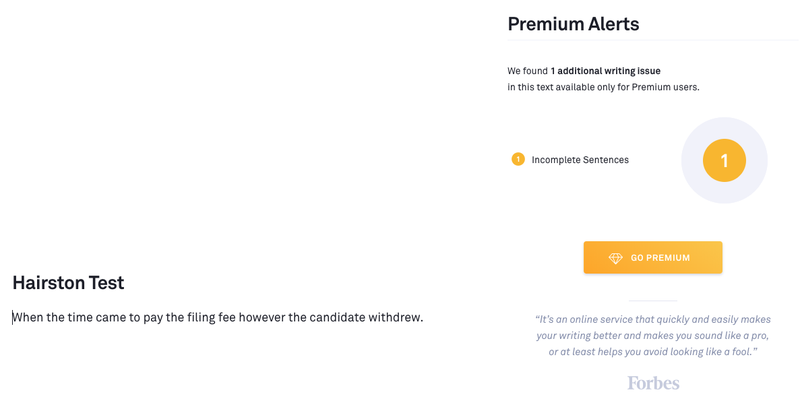 Not sure why that’s considered “word choice,” apart from the obvious fact that changing anything in any sentence beyond punctuation is going to mean choosing different words. Another status marker, correctly identified. Given what we know about patterns of error and writers’ ability to reduce error over time with guided practice, I’m curious about the pricing model for tools like Grammarly. A good grammar checker, to my mind, is one that would help writers learn to avoid mistakes in the first place, and so become less dependent on editorial assistance. 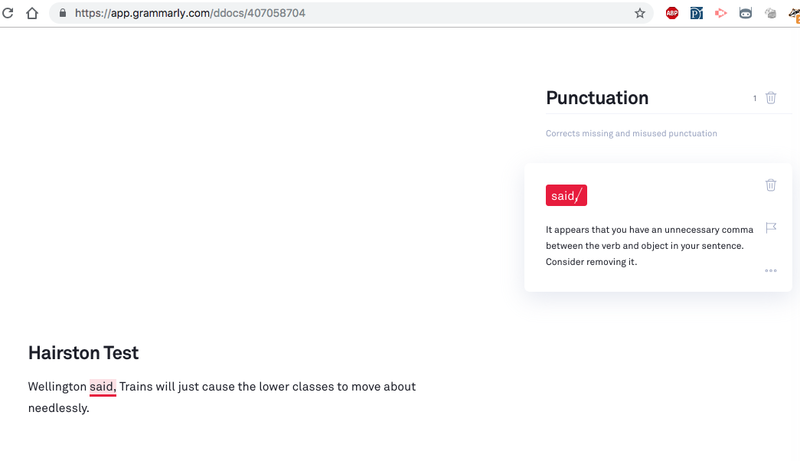 But if a tool like Grammarly does help people learn grammar, they won’t need Grammarly anymore. 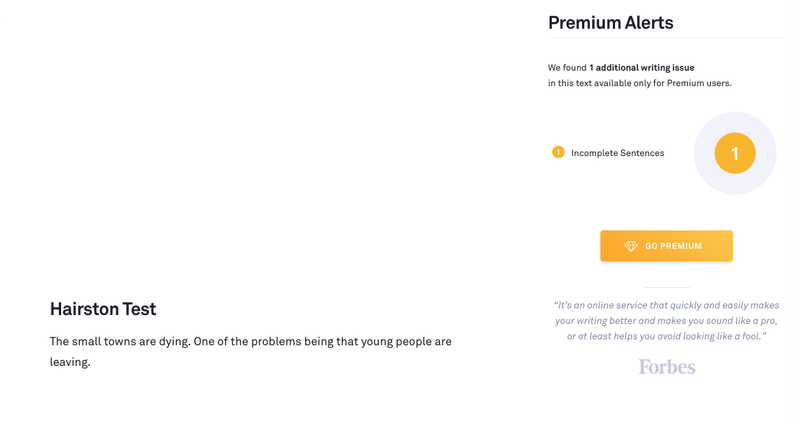 Giving people usable, transferable skills to improve their grammar would seem to undercut their business model. It’s entirely possible (likely, in fact, given what I’ve found looking at similar products) that Grammarly simply isn’t very good because good writing rests on human interpretations of meaning, which machines are notably bad at. But, we should never assume that any software purporting to assist writers is truly “educational” in its intent — especially if it is a for-profit product. Such a tool generates income when it creates dependency, not autonomy.